I stood on the edge of America, sand under my feet and the warm water from the Atlantic Ocean washing over my toes. On the horizon I could see them: early morning thunderheads. All lined up and towering into the sky – some closer, some farther away – but all beautiful and majestic; standing like sentinels ready to fight an unseen enemy and seemingly ready to protect. As I watched, some of these thunderheads developed into giants, with the telltale anvil head shape. While others, shaded from the sun by the larger clouds, simply died off, giving no rain to the earth. This made me think of the parable Jesus told about the seeds scattered along the roadside. Some of these storms had taken root, but in shallow ground. After starting out quite hopeful and impressive, they died out in the shadows of those who were fulfilling their cyclic duties of sea to rain, rain to sea–their roots were not deep enough. I could certainly relate. As an only child of a widowed mother, I was raised on my grandparents’ farm in Georgia. My mother and I attended the Methodist church, while my grandparents attended the Baptist church, so I was exposed to both denominations. I loved the Methodist church because of the structure of the service. There were certain things that were said and sung each Sunday, and these familiar items were a comfort to me. Little did I know then that these were actually sayings and songs left over from their Catholic heritage. When I was 12, my mother married again and we moved to a small town in another part of Georgia, far away from what I considered to be my home. It was there that I met one of my dearest friends, who happened to be a Catholic. In fact, she was the first Catholic I had ever met. We became like sisters, yet she never tried to teach me about her faith; I don’t think she even knew much about it herself. I did attend church with her once; and was awed by the beauty of her church. Looking back, I now wonder why, as a descendant of an Irish great-great-grandfather, I was not Catholic. Said grandfather had actually been a “Hardshell Baptist” circuit preacher. I am not sure how he went from Irish Catholic to Hardshell Baptist; evidently somewhere along the family line our Catholic roots had totally withered and died. Since my stepfather was transferred every few years with his job, I soon had to say goodbye to her, and our family moved to another small town in Georgia. By this time, I had my driver’s license and began attending the Baptist church with a friend I had met at school. I enjoyed the services and I knew Christ was my Savior, so I was quite satisfied with my spiritual life. However, the roots of my faith weren’t deep. Upon graduation, I married my high school sweetheart who was then attending college. We were of differing religious backgrounds, so we set out on a quest to find a faith we could both agree on. His mother had just joined the Church of Latter-day Saints (the Mormon Church), and in an effort to respect her, we agreed to allow the Mormon missionaries to visit us. I was immediately drawn to their sense of family, high moral standards, the claim of “authority,” and the fact that they assured me that I could have my family with me in heaven. What a wonderful concept it seemed to be – eternal families. We joined the Mormon Church within a few weeks of the missionaries’ first visit, and I remained a faithful member for 40 years. My husband and I, however, divorced after 4 years. After my divorce, I continued with my college studies with plans to eventually become a guidance counselor. Life, instead, had new twists and turns in store for me. I ended up not being able to complete my junior year of college and had to move to Florida where I met and married my second husband. He had no religious ties to any church and agreed that our children could be raised as Mormons (not that I was attending the Mormon Church, or even living their standards at that time). Eventually I decided it was time to go back to church so I began attending, taking our children with me. The Mormons have a very high moral standard that they teach the youth. High school students attended what is known as early morning seminary, where they study the Mormon faith each morning before school. This meant getting up at 5:30 a.m. each school day to attend a 6:00 a.m. class of religious instruction. I found that the Mormon Church has an excellent program in place for teaching the faith to the youth, and as a result, none of our children drank alcohol, smoked, cursed, or rebelled in any significant way. The Mormons also have a very driven fellowshipping program in place for bringing converts into the church. My husband was invited to participate in their softball, basketball, and volleyball games, which he thoroughly enjoyed. Through this fellowshipping by the men of the church, and through the example of our children, he became a member and I immediately began preparing our family to be sealed in the temple. In the Mormon faith, couples that meet certain requirements (i.e., full tithe payers) can be sealed in a Latter-day Saints temple. When you are sealed, it is like a marriage ceremony, but instead of the usual “until death do you part,” it is for “time and all eternity.” This idea of a marriage that does not end at death, but carries on forever, is based on Matthew 16:19 where Christ says to Peter “I will give you the keys of the kingdom of heaven; whatever you bind on earth will be bound in heaven, and whatever you loose on earth will be loosed in heaven.” The Mormons translate this to apply to the temple marriage, and therefore, the marriage will be “bound in heaven.” One year after my husband joined, we were allowed to be sealed as an eternal family. I was over the moon with happiness because I believed our family was now going to be together forever. I thought my roots were finally planted in good soil. I was very active in the church, teaching Primary (Sunday school for children ages 3-12), and Young Women (Sunday school for girls ages 12-18). Yet even while teaching the youth, I had begun to have doubts. When my first husband and I met with the missionaries, I had asked about their belief in polygamy. I was assured that this was only practiced as a means of providing for the women and children who had lost their husbands and fathers on the “trek west.” It was explained to me that the men who kindly and generously took these women and children under their wing did it only to provide for the temporal needs of said women and children. I later found out that polygamy was to be reinstituted upon our arrival in the celestial kingdom (the highest level of heaven to the Mormons), and I would be forced to allow my husband to have multiple wives if I wanted to remain in this highest heavenly kingdom. Not all Mormons, though, believe this. Some of the leaders that I knew said this was true, while others denied it, at least in part. The whole concept of polygamy made me sick, and the fact that the leaders were not in agreement did not inspire confidence. I realized at some point that I did not believe the Book of Mormon was really an inspired book, and that I did not even believe that Joseph Smith was a prophet. It became clear that I was only a member of this church because of the eternal family doctrine, which I clung to with all my might. Being an only child of a single mom for 12 years, I wanted my family with me more than anything I could imagine so I did not dare question the church. Also, having been sealed in the temple, if I left the church I would not only lose my family, but I would be sent to a place called Outer Darkness to suffer for eternity with Satan and his followers. With that threat being held over me, I kept quiet and appeared to be a well-indoctrinated member, but my roots in the Mormon religion were no longer deep. One night while watching television, I started channel surfing and happened to find EWTN’s The Journey Home program just as Marcus Grodi was saying that the guest that night was a former Mormon. I immediately knew I had to watch this show. Part of me hoped that I could prove this guest wrong (after all, who wants to find out that they have been hoodwinked for the last 40 years), while part of me hoped my doubts about the Mormon Church would be confirmed. As I listened, I heard about things I had never known – things that are not generally taught to the church members. The guest spoke of a history of the Mormon Church that I did not know existed. I realized that he was using church documents as his references, not anti-Mormon literature. This was important, because as a Mormon, I had been carefully taught to distrust materials that were not approved by the church. All anti-Mormon material, according to the church, was comprised of lies perpetrated by Satan to mislead “even the elect.” As soon as this program ended, I was on the computer searching the Brigham Young University website. I found the things he had spoken of. The more I searched the actual history of Joseph Smith and the Mormon Church, using the church’s own documents, the more upset I became. History proved that the Mormon Church was false. I knew that very night that I could never go back – and I also knew that God loved and knew me – that He had led me to watch that particular episode of The Journey Home in order to bring me home. I shared some of this with my husband, but he did not want to hear it. I was now without a church and I was scared. My husband, my children, and my grandchildren are Mormon, as well as all my friends. I had to embark on my new faith journey alone; feeling like I was in a dinghy trying to stay afloat in the middle of a hurricane, with no idea where to go. Now I had no roots at all. The question now was where to go? I went back to a basic belief that, even though the “authority” that the Mormon’s claimed to have was not the real authority, there must be authority somewhere. How else could one know what Christ taught? I decided to go in search of the authority by searching history. Through watching The Journey Home on a consistent basis, I had learned that there actually is a history that you can study (who knew?). I quickly discovered that the only possible options were the Catholic Church and the Orthodox Church. Even though it had been a Catholic station and Catholic program that had rescued me from the Mormons, I was not about to be hoodwinked again. I studied the early Church Fathers. 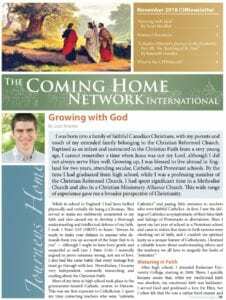 I continued to watch The Journey Home, and went online to the Coming Home Network’s website to listen to the stories of other Mormons who had become Catholic. I began watching Mother Angelica’s show, as well as other programs on EWTN, soaking up as much as I could, as fast as I could. I seemed to be drawn to this channel whenever I turned on the television. I attended an Orthodox church in order to learn their beliefs, but there was no central authority there and I knew in my heart this had to be present in the church I joined. Without this, the doctrine could shift and change according to any politically correct climate, as I had seen so many Protestant churches’ positions on abortion change. The more I studied, the more it came back to the Catholic Church. 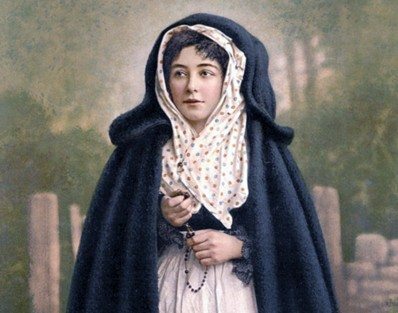 I read of the many priests and nuns who had been martyred over the centuries on account of their Catholic faith; of those who had journeyed across Europe to spread the news of Christ; of those who had been rich yet gave it all up for their faith. I learned of the apostolic Tradition, something I never knew about, and how it had been faithfully handed down to the Apostle’s successors. I saw how the Catholic Church had carefully and lovingly guarded the Faith, fought heresies throughout the ages, and kept Christ’s teachings safe for the whole world. History was on the side of the Catholic Church – it had survived and thrived against all odds. How naïve, how utterly clueless I had been about the beauty of the Catholic Church. How had I not known about the Eucharist? As a Methodist/Baptist, I had taken “communion,” which consisted of bread and grape juice, and I was taught that it was only a representation of Christ. As a Mormon, I had taken “the sacrament,” which consisted of bread and water, and again, it was just a representation of Christ. I had never heard of the Eucharist and how it is actually the Body, Blood, Soul, and Divinity of our dear Lord. What a magnificent gift! How had I not seen and understood the Scriptures wherein Christ chose Simon as the rock on which to build His Church, and even changed Simon’s name to “Rock?” If Christ had not intended for Simon to be the “head” of the Church, then there would have been no need to change Simon’s name to Peter (rock). Of course Christ would set up His Church and its leadership before He left us! How had I not understood the verse where Christ promised that the gates of hell will not prevail against His Church? After reading and studying for about a year, I entered the RCIA program at a nearby Catholic parish. I was surprised to find that you could not just join the Catholic Church without first having studied the Faith for quite some time. This was such a refreshing concept. The Protestant religions I had studied, as well as the Mormons, encourage you to join almost immediately, with little or no actual knowledge of their belief system other than a belief in Christ. The Catholic Church wants you to know the Faith, love the Faith, and cherish the Faith before you enter into communion with it. In RCIA, I received correction about many misconceptions I had, such as the fact that Catholics do not worship Mary. Since I had been divorced, the RCIA director gave me directions on how to start the annulment process. I now had to find my ex-husband. In the process of searching for him, I discovered that he had passed away about 15 years earlier. An annulment was not needed and I could proceed with my plans to enter the Church. At the end of the RCIA class year, I was baptized and confirmed a member of the Catholic Church at the Easter Vigil of April 2011. I still have so much to learn – more than I ever imagined, but with each new pearl of knowledge, the majesty of the Catholic Church becomes more evident. She is my home, a mansion with many rooms which I have yet to explore, each room furnished with more incredible, beautiful teachings. I cannot thank God and Marcus Grodi enough for having an ex-Mormon guest on that November evening in 2009! It was through that particular show that I was jolted out of my comfortable, spiritual easy chair and made to face the truth about Mormon history, which, in turn, eventually led me into the waiting and welcoming arms of the Catholic Church. I was baptized and confirmed at the Easter Vigil on April 23, 2011 by an Irish priest. The neatest thing is that once I met “my” Irish priest, I remembered long ago dream-like longings to confess to an Irish priest, to receive the blessings from God through an Irish priest. It was like my spirit had always known he would be there waiting – I just had to be ready. Maybe some of my Irish ancestors who are in heaven have been working overtime to bring me full circle. So, like so many Journey Home guests have said, I can also say that I too have finally come home to the Catholic Church. Thanks be to God, to Mother Angelica for starting EWTN all those years ago, and to Marcus Grodi, and his staff and guests for working tirelessly to bring such wonderful conversion stories into our homes. I am starting to grow new, stronger roots, and this time my roots are grounded in the faith of my fathers. Beverly White is a former Mormon from Orange Park, FL.